The next couple of days look to be windy and wet, so this morning I figured I'd go someplace where I could enjoy the outdoors. Although the warmer weather has melted most of the snow, I didn't want to deal with the muddy trails at Stillwell just yet. I decided to go to Bethpage and hoped that the gates were open. When I arrived, I saw a large maintenance truck parked in front of the gate and feared that access would be restricted. I then saw that the gates were open, and as I made my way in, I noticed a couple of people running on the path. The trail head was blocked off with a webbed fence and a sign saying "entrance closed." Like everyone else, I ran around the sign and headed up the hill toward the original trail. Despite seeing two runners as I drove in, the trail was almost empty. That wasn't a surprise, as it was a Tuesday morning, not the weekend when I usually run there. I liked the quiet but I wasn't loving the run for the first mile. My legs felt leaden and I wondered if I should have taken an extra day's rest after my race. I started the day with my Fitbit and was curious to see what data it would capture during my workout. After I reached the one mile point, I turned around and headed back in the other direction. I wasn't looking forward to running up the big hill, but at least I'd be doing it while I was relatively fresh. Once I made it to the top, I continued east and reached the entrance to the new section. I had covered two miles and my legs still felt like they were carrying ankle weights. Bethpage is hilly and the route is rolling. Most of the time you are either running uphill or down. The first segment of the new trail has a series of hills that are individually short, but collectively challenging. I ran down these hills until I reached three miles, where I turned around and went right back up. Once I got past the worst of it, I noticed that my legs were feeling a little more flexible. Once I finished my run, I looked at the Fitbit and saw that I'd covered about 7,000 steps and climbed the equivalent of 16 staircases. The activity meter on the Fitbit (a flower) was full to the top. It also captured my distance accurately, along with calories burned. 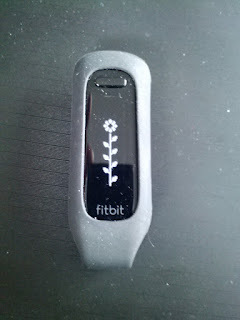 I liked that the Fitbit, unlike the Garmin, is always on and ready to capture activity at any time. But the Garmin provides valuable data that the Fitbit doesn't record, so I'll use them together. After lunch, my wife and I went to a local park for a walk and I picked up enough steps for me to modify today's goal to 13,500. My wife already has me beat, and I can see it will be hard to keep up with her. But today was a great start.